I can’t fully remember when I first recognized that something to do with tech “diversity” efforts were a bit…off. I think it was during the first Women Techmaker’s Summit. It was early 2014 and Google put on this relatively large conference at the Mountain View campus for to celebrate International Women’s Day. I remember being impressed at the scale, while also thinking that Google had never done anything approaching that for Black History Month. The bone the black folks were thrown were some changes in the menus and some one-off events the Black Googlers Network put together. The summit itself was great. The team did a great job, and were I a white woman in tech, I probably would have been delighted at everything…but I’m a black woman in tech, so things didn’t feel quite so good to me. The intro to the summit itself was telling. It was titled “Opening Remarks and Diversity At Google,” yet there was no mention of any other forms of diversity besides “women.” In March of 2014, when the summit was held, before the first release of it’s diversity numbers, Google had not yet started tagging “and people of color” to every mention of women when it related to diversity. Diversity is now A Thing in tech. Google releasing their employee demographics a short two months after the Women Techmaker’s event set off a wave of other tech companies releasing that information. No company wants to be seen as a place that doesn’t celebrate diversity. Usually the trumpeting about diversity comes after a company releases the mediocre to terrible numbers that highlight just how recently they began noticing the homogeneity of their workforce. “This is important to us, we’re working on it,” is often the message. The work, though seems to favor one group more than others: women. Whether by design or by inertia, the favor seems to land on white women in particular. Salesforce recently had its annual takeover of downtown San Francisco conference they call Dreamforce. 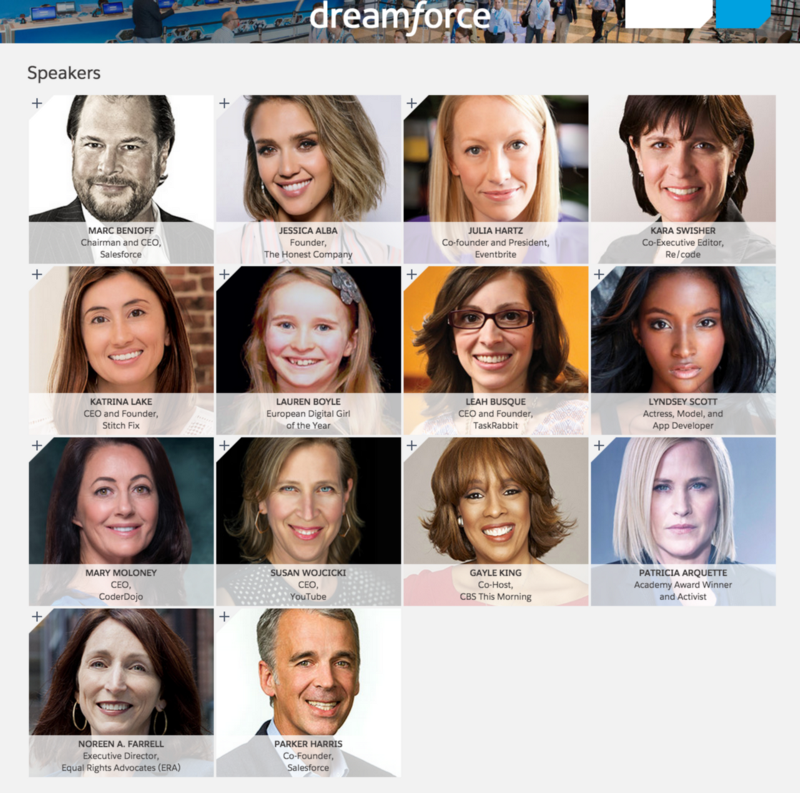 This year at Dreamforce, they dedicated an entire day to a Women’s Leadership Summit. Let’s leave out that there was no “…and people of color” leadership summit. Let’s not mention that they could only manage to find one black woman that actually works in tech to speak. And let us never speak of the last minute addition of Gayle King and her baffling Q&A. Let’s only reflect on the truth that came out of this summit: that diversity for many, means women, and mostly, usually, white women. Not wanting to leave any doubts about this, both Marc Benioff and Parker Harris made sure to mention that they are focused on (white) women. The panel “Building an Inclusive Workplace,” was billed as the following: “Salesforce Chairman and CEO Marc Benioff and co-founder Parker Harris will talk with Kara Swisher, Co-Executive Editor at Re/code, about how Salesforce is tackling issues related to diversity in tech.” Right. 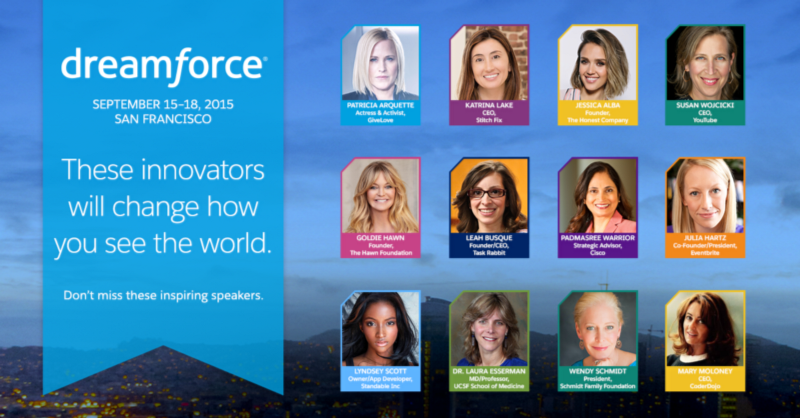 Two white dudes and Kara Swisher will talk about how Salesforce is tackling issues related to diversity in tech. Except, in the world of those two dudes, diversity in tech = (white) women in tech. On the panel, which has since been retconned to “Advancing Women in the Workplace”, Kara, who has been a rare champion for all forms of diversity in tech, pointedly asked the two leaders of Salesforce about diversity beyond just women. At this point, Marc and Parker could have stated their commitment to advancing diversity on all fronts within their company. Instead they doubled down on their focus on women. Kara: Let’s talk about diversity beyond just women. It’s another, I mean, some of the statistics, and again, Salesforce has the same, they’re almost exactly carbon copies of each other, every company. I think Slack is the only one that starts to get interesting in terms of shifting it to, I guess to 50/50. It’s getting close, it’s getting very close there. Um, he’s made it a priority, for sure. Um, but numbers persist. Give me, each of you, why don’t we start with you Parker, like two things, the real specific things that could be done that would change that. Kara: Yeah, that would change other forms of diversity. Parker: Well, right now I’m focused on women, you know, and it’s back to Marc’s focus on priorities. I have employees, that are, you know, other types of diversity coming to me and saying well why aren’t we focused on these other areas as well, and I said yes we should focus them but, you know, the phrase we use internally is “If everything is important, then nothing is important.” And we repeat that over and over again. And, we’re trying to figure out how can we move this one thing forward, and you know we don’t have all the answers, so I can’t sit up here and say I’ve got it figured out. I don’t know how to build a lot of our products, it’s the people in our company that know these things and so our job as leaders is to figure out how to unlock the understanding and then learn as we move forward to move something like this forward. Kara: Is overall diversity as important to you or do you think you just have to move, as Parker was saying, move piece by piece? Marc: Overall diversity is extremely important to us, right now, this is the major issue (gesturing to the room/crowd). I think when we feel like we’ve got this, you know, a little bit more under control, then I think THAT one is gonna surface as the major thing we’re focusing on. We’re not ignoring it, it’s something that we support, it’s something that we’re working on, but this is our major focus right now, is the women’s issue. Marc and Parker’s words echoed the message many Silicon Valley companies have been saying with money: Get in line people of color. Wait for (white) women to get theirs, then we’ll get to you. The Grace Hopper Conference, put on by the Anita Borg Institute, is a celebration of women in computing. Every year it invites women in tech from around the world to come together in one place. Attendance grows with every conference; last year over 8,000 women joined the celebration in Phoenix, this year over 12,000 are meant to be in Houston. With that number of attendees, their networks, and connections to many big name tech companies, Grace Hopper and Anita Borg should, by all accounts, have access to virtually every woman in tech. Yet for the 2015 conference, they could not manage to find one black woman to be a “headline” speaker. Two white men are included in the set of headline speakers at a conference celebrating women in technology, but not a single black woman. This would be surprising if not for the following: there is not a single black woman on the Anita Borg Board of Trustees. There is nobody in leadership at Anita Borg that doesn’t see themselves represented by the headliner speakers at Grace Hopper, so it probably doesn’t even register as a problem for them, which is at the root of the problem with Colorless Diversity. Two white men are included in the set of headline speakers at a conference celebrating women in technology, but not a single black woman. Corporations that practice Colorless Diversity do not see lack of racial diversity and representation as an important problem to be solved. To bring up racial diversity is to invite a discussion on model minorities (“Look, we have Asians!”) and have the subject be dismissed. The “women’s issue,” on the other hand, is urgent. As a result of familial bonds and their savior complex driven need to rescue the damsel in distress, the white-male employees of the white-male dominated industry have learned to empathize with the struggles of their women in tech. How frequently we hear the refrain “well I had a daughter/wife/sister and suddenly I realized that I didn’t want them to have to experience the problems in the tech industry, so I want to fix the problems.” The beeping sound you hear is the dump truck of cash backing up to every organization that even slightly aligns themselves with the cause of women in technology. Practitioners of Colorless Diversity follow suit, focusing attention on fixing the problems for women. Rarely, though, will you ever hear a white person lamenting about working conditions that their black/brown child/spouse/sibling might have to endure, because they rarely have those relationships, so aren’t forced to develop empathy for brown/black people. For these folks, anything to do with improving the environment for black/brown people or increasing the number of brown/black people they hire is about PR. Colorless Diversity is ok with spending tens of millions of dollars on conferences, summits, retreats, and outreach for and about (white) women, but finds it distasteful when one points out the disparity in spending for people of color. Colorless Diversity would have black/brown people sit down and wait their turn. While making lots of noise about all male panels, they rarely, if ever, make a fuss about, let alone refuse to sit on a panel that doesn’t include brown/black women. Let me be clear in stating that I am not writing this because I think it’s bad that companies are spending money on diversity programs for women. That is needed and necessary. I write this because while they are spending huge amounts of money on women in tech, they aren’t spending equally on people of color in tech. The little money they ARE spending isn’t focused on celebrating or including the people of color in tech, it’s aimed at kids of color who might never be interested in this industry, as though the people of color already in the industry are a lost cause. I also write this because of late, I’ve noticed a bit of an issue: (white) women seem to be satisfied with the state of Colorless Diversity in the tech industry. Things are Changing. Money is being spent. Numbers are improving. This is Good. They rarely, if ever, speak about the dearth of black/brown women at events aimed at women. While making lots of noise about all male panels, they rarely, if ever, make a fuss about, let alone refuse to sit on a panel that doesn’t include brown/black women. They rarely, if ever, make the decision to cede the privileges, power, or space granted to them by dint of their whiteness to a person of color. I cannot blame the (white) women for this. They were raised in a society built on white supremacy. But so was I, and I know what it looks like, and I know better. I’m done with fighting for the kind of diversity that unequally benefits one group. I’m done with fighting for “Women in Tech.” I won’t fight against “Women in Tech,” I will still cheer for “Women in Tech” when progress is made, but “Women in Tech” don’t need me to battle for them. “Women in Tech” have the Benioff’s and the Parker’s and the Anita Borg’s and the whole of Team Colorless Diversity to fight for them. Somehow I stumbled on a platform, a soapbox, that gives me some amount of privilege in that I have a voice people listen to. I will not, cannot, use that privilege to reinforce and support problematic power structures. Instead I will use that privilege to raise the voices of the brown and black people that Colorless Diversity seems to gloss over. I will use that privilege to call out white feminism in tech when I see it. I will use that privilege to support and celebrate the people and organizations who champion intersectionality. I will stand on my soapbox, for however long I’m up here, and shout the triumphs of black women in tech. So when people ask me about the latest white woman in tech darling, instead I’m going to speak about Kristy Tillman and Kaya Thomas and Morgan Debaun. And no, my women in tech friends, I’m not going to Grace Hopper. While I would love to hang out with, meet with, talk with all of you, I can’t support a conference that doesn’t seem to understand the value and importance of intersectionality and representation. I solve puzzles for fun. I work on Engineering Management at Patreon. I am enthralled by building great teams. I like gummy bears. I believe in you. Words about humaning and other hard things.